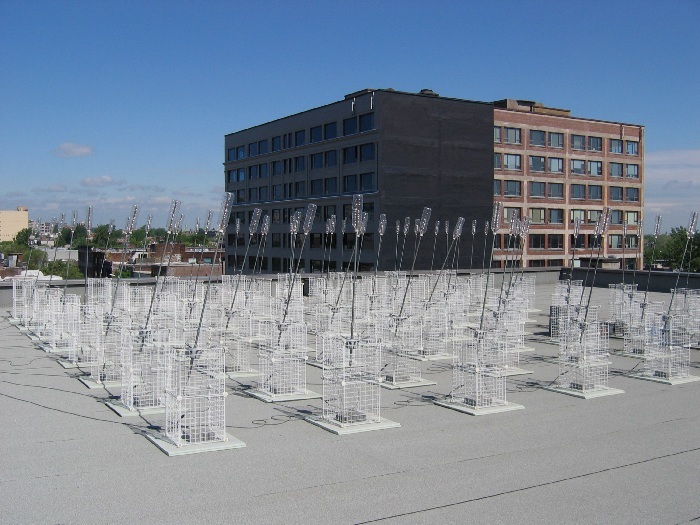 The Wind Array Cascade Machine (WACM), 2003, is a 64-channel sensor network designed to capture in real time the kinetic wave patterns of the wind across a horizontal surface analogous to the wind patterns observed blowing across a prairie field of wheat or grain. The 2-metre tall “wheat stock” sensor units record the velocity (amplitude) of the wind by measuring the tilt of the sensor as affected by the force of the changing flow of the wind. While data collected by each sensor is relatively simple, wave complexity is formed by the entire 10 metre x 10 metre, 64-channel grid network. These wave patterns represent the movement of sound (sine) waves in space, including the effect of architecture space that sound waves exist in. This is the beginning conceptual formulation of Wind Space Architecture. 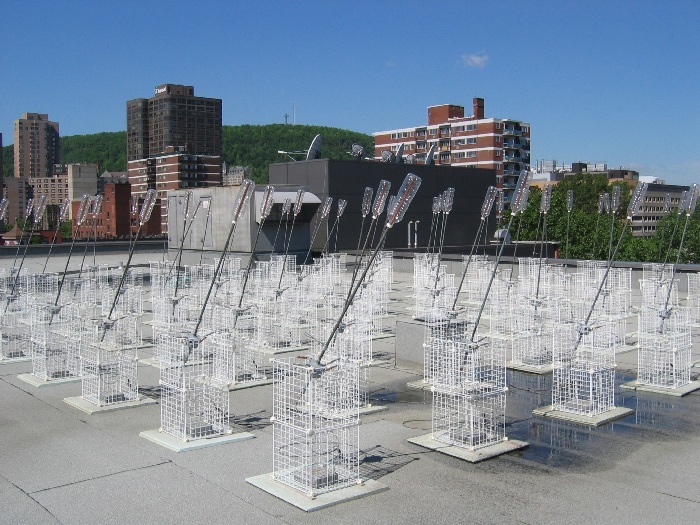 The data generated by the WACM, when it was located on rooftops in Québec City and Montréal QC from 2003 to 2005, was digitally recorded and archived, like a film or photograph. 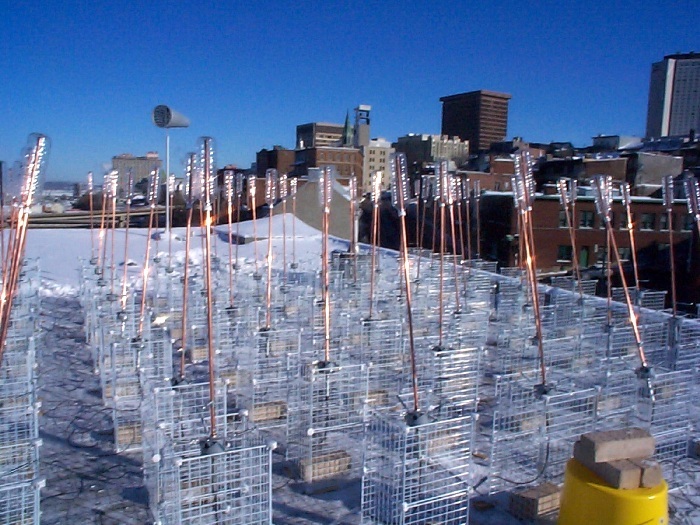 Originally, the WACM data was streamed from Québec City’s rooftops in real time over the WWW to the 64-channel light installation POD (2003) while being exhibited in parts of Canada or Europe. This achievement, in 2003 makes the WACM / POD combination, a rare technological example of synchronized multi-channel data streaming, as the wind in Québec was being transported instantaneously thousands of kilometres away and reformed for the public. Several installations were created for the WACM data set, compositions, and presentation systems including: POD (2003), Signe v1 (2005), Paravent (2006), the Synae Screen (2006), Turbulence Sound Matrix (2008) and Signe (2008). 2004 • Kiasma Museum of Contemporary Art – The Finnish National Gallery, ISEA 2004 Wireless Experience Exhibition, POD: Wind Array Cascade Machine, Helsinki, Finland. The original electronic and software systems for WACM were designed in collaboration with Avatar (technicians: Steeve Lebrasseur and David Michaud), Québec, QC/CA. WACM was created during a generous artist creation and production residency at Recto-Verso / Mois Multi Festival (2003), Québec, QC/CA. WACM was produced with the assistance of the Media Art Section of The Canada Council for the Arts. The donation of rooftop access in Québec City was given by the Méduse Cooperative in collaboration with Avatar and Recto Verso, and in Montréal by the Daniel Langlois Foundation and the Excentris building.